In the annual America’s Favorite Places survey, readers of all stripes evaluate hundreds of cities and towns across a range of categories, from the friendliness of the locals to the quality of the pizza. Unlike Travel + Leisure‘s World’s Best Awards, which encourages readers to weigh in on travel experiences across the globe, the America’s Favorite Places survey is a way for locals to share what their hometowns do best. Other destinations that readers think deserve a better reputation include a petite Northeast city with a revitalized arts scene, a Southwest town with stellar access to hiking and skiing, and a town in California with restaurants that are well worth their high prices. Did your hometown make the cut? From big cities on the East Coast to small, southern hubs, don’t overlook these U.S. cities. This New Mexican city was bubbling under the radar long before “Breaking Bad” thrust it into the limelight. Less artsy than nearby Taos or the capital, Santa Fe, Albuquerque is an affordable destination for outdoors enthusiasts, thanks to reliably perfect weather and the Sandia Mountains that dominate the city’s skyline. They’re home to more than 100 miles of hiking trails and the Sandia Peak ski area. Take the Sandia Peak tramway—the world’s second longest—to the summit of the range for epic views over 11,0000 square miles of New Mexico terrain. Another jewel in Albuquerque’s crown? The city’s got some seriously good bakeries. The City on a Hill gets looked down upon a little too much, say T+L readers. They admire Boston for its top-notch cultural institutions and historic sites, many of which can be seen in the walkable downtown and Back Bay neighborhoods. For something new, head to the booming Seaport District, where parking lots have given way to shiny offices, shops, and restaurants. Committee, one block from the ocean, is a buzzy Greek meze spot serving small plates and dangerously good cocktails. And across the Charles River in Somerville, L’Espalier alum Michael Bergin’s Fat Hen is proof that Boston’s food renaissance extends beyond the city limits. The Second City often plays second fiddle: too small to be as happening as Los Angeles, too big to be as cool as Austin, and just, well, not New York. But T+L readers strongly disagree. They recognize Chicago as one of America’s top food cities, home to both cutting-edge dining and what might be the country’s most heavenly regional comfort food (think deep dish pies). The Windy City is also home to a vibrant theater community, world-class museums, and a stacked lineup of concerts. Readers also value Chicagoans for their devotion to their local teams. This past fall, they finally declared themselves second to none after the Chicago Cubs won the World Series. Readers think the City by the Bay gets a bad rap, mostly for being prohibitively expensive. But once you’ve gotten over the sticker shock, you’ll find San Francisco’s sheer density of dining and cultural options makes the cost worthwhile. Case in point: the exorbitantly pricey tasting menu at Saison, a triple Michelin-starred restaurant from Joshua Skenes in SoMa. Yes, the dinner may cost more than your flight, but it’s also a wild ride through 15 courses of fire-grilled perfection. One way to save a little money? Walk. Nearly everything is within walking distance to everything else, as long as you’re fine with hills. T+L readers think NOLA has an unfair reputation as a simple party town. While the Crescent City is, undoubtedly, a top destination for a wild getaway—hello, Mardis Gras—it’s also a complex city warranting more than three days of debauchery. New Orleans’s French, Cajun, and Creole heritage makes it one of the most culturally unique cities in the U.S. It has its own architectural styles, its own take on Jazz, and its own cuisine: beignets and po’ boys, yes, but also char-grilled oysters, muffaletta sandwiches, jambalaya, and boudin sausages. Travelers can find many New Orleans specialties at Mother’s Restaurant, open since 1938. In 2016, T+L readers crowned Charleston the World’s Best City. But they still think it deserves more love than it gets. It’s hard to disagree when you consider the gorgeous 19th-century row houses and mansions lining the jasmine-fringed streets surrounding downtown. In Charleston, a bevy of chefs are bringing Southern cooking to new levels. And that’s not to mention the Charlestonians themselves. They are consistently ranked some of the country’s most attractive and affable locals. You may soon want to plan a trip to visit Indiana’s state capital, Indianapolis. The city has a booming craft beer scene and a world-famous love for sporting events. T+L readers also rank Indianapolis highly for its exceptionally friendly residents and low prices. 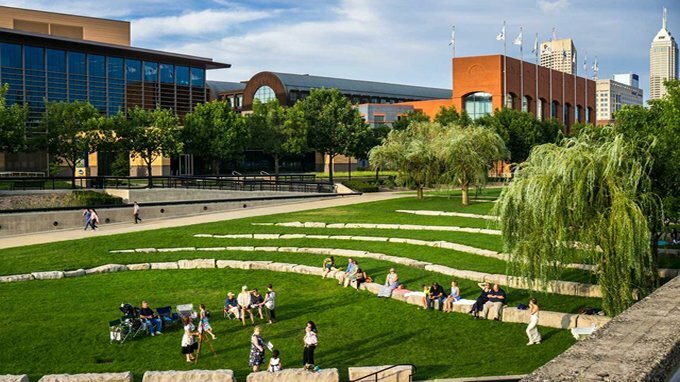 Explore the city on the new Indianapolis Cultural Trail, an eight-mile ring of bike and walking paths connecting neighborhoods around the vibrant downtown. Hotel companies have started to take notice of Indy’s newfound clout as a travel destination. High-end furniture retailer, West Elm, will launch its new hotel brand with an Indianapolis property in 2018. Buffalo made a splash this past year, vaulting to the top of the America’s Favorite Cities list, thereby proving that every underdog has its day. The upstate New York city has developed a vibrant arts scene, ramped up its festival calendar, become a leading craft beer producer, and perfected the pizza pie (the local variety is something of a mix between New York thin-crust and Chicago deep dish). In spite of their trendy advances, Buffalo residents have maintained an affable, welcoming attitude: T+L readers ranked them high for friendliness. And all this has happened while the rest of the country was looking elsewhere. Finally, T+L readers took notice. T+L readers are singing praises for Music City. While drama unfolds in each episode of the hit show “Nashville,” the actual city is a low-key, friendly destination, said T+L readers. They gave the locals high marks for being kind, and appreciated the city’s deep-seeded love for music. In particular, readers felt Nashville deserves more recognition for its concerts and live music scene, both for established acts at the legendary Grand Ole Opry and for rising singer-songwriters at open mic nights. Another reason to add Nashville to your 2017 vacation plans? It’s home to some of the best barbecue in the country. Readers voted Providence America’s Favorite City in 2014, but they think the rest of the country missed the memo, and called it the country’s most underrated destination in this year’s survey. The Rhode Island capital has the quality bakeries, craft breweries, food-trucks, and innovative bars you’d expect in a city five times its size. Its compact core makes exploring by foot a winning option for visitors, who can meander the historic neighborhoods and revitalized waterfront. Keep up with the locals by drinking their favorite fuel: coffee milk, a workaholic’s take on chocolate milk that dates back to the 19th century.